Tricks for Keeping your House Clean and your Sanity Intact! I would like to preface this post by saying that Mom-ing isn't a competition, and in no way am I suggesting that having a clean house is imperative or better than any other kind of house. Parenting looks different for everyone and there is not one way that is better than another. However, I am constantly asked how I manage to keep my house so clean and organized despite having 4 kids and a full-time career that keeps me super busy. The truth is that with the right tricks, it's easy and not too time consuming. Trust me, I spend plenty of time sitting on the couch watching Gilmore Girls reruns on Netflix. This post contains affiliate links. If you purchase these products, I might make a small commission. I do not promote products that I do not use myself! In this post, I am going to share my tricks and hacks that keep my house in great shape all of the time. This is probably the best tip for keeping your home tidy and organized. Throughout the day, things get moved around, trash and dishes get piled up in different parts of the house, and even the most organized home can get out of control pretty quickly. This is why I never leave a room empty-handed. In fact, I often leave rooms carrying arm loads of stuff. If I'm watching TV in the living room, and I run into my bedroom to use the bathroom, I make sure that I leave my bathroom and bedroom with something. A dirty diaper that got left from erlier in the day, dishes, trash, the laundry, etc. It only takes a minute to dump a load of laundry in the washing machine or to put some glasses in the sink so I can be back on the couch watching Netflix in just a few minutes. If you have a 2-story house, put a basket at the bottom and top of your stairs to collect items that need to go up or down, and when you make the trek up or down the stairs, take the items with you! I use this strategy every time I go into my kids' bedrooms, out to the lanai, or even if I go out to the garage. Never leave one room to go to another room empty-handed. This way you are not setting aside specific tidying-up time and it becomes part of the movement you were already going to do! One of my favorite products is Clorox Disinfecting Wipes. Those suckers are so handy. I keep a bottle of them on the back of every toilet in my house. At least once a day, after I use the bathroom, I pull a wipe out and wipe down the entire toilet. Usually once every-other-day when I brush my teeth, I'll pull a wipe and wipe down the counter and the sinks. This keeps the bathroom really clean in between deep-cleaning, which I do once a week. Because the bathroom is always clean, my once-a-week deep-cleaning isn't as much work and usually only entails cleaning the mirrors, the tub, and the shower. At night when I say goodnight to my boys, I pop into their bathroom and tidy up and wipe their toilet and counter with Clorox wipes. I usually wipe the floor around their toilet too because... well, boys. This keeps their bathroom clean all week, too. Clorox Wipes are relatively inexpensive, and with Amazon's Dash Buttons, you can order them whenever you are almost out. This way your bathrooms are always clean! Dash buttons are a great way to quickly order products that you need, and Amazon will ship them right to your door in 1 or 2 days with a Prime Membership! My parents bought us a Roomba for Christmas last year, and it was the best gift I've ever been given. My Mom thought that it was kinda lame to gift smeone a vacuum for Christmas, but it's not a vacuum! It's a ROBOT! My house is 2000+ square feet of tile floors, so I used to spend an hour every night sweeping every room. Because we live in Florida, sand gets inside of the house no matter what we do, so sweeping it was a continuous chore. With Roomba, I can schedule when it runs, so I run it during the day when we are all at work and school, so we never hear it, and the floors are always clean. All I have to do is dump the tray every few days and clean the brushes once a week. 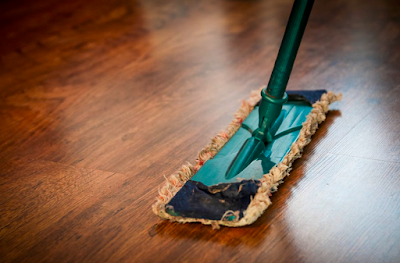 It does a fantastic job of keping the tile floor clean and even vacuums over our area rugs! iRobot has an app, so when Roomba is finished cleaning, I receive a notification to my iPhone! Also, I was able to link my Roomba to my Amazon Echo, so I can tell Alexa to ask Roomba to begin cleaning or stop and go home. This makes Roomba a great addition to the smart home product family. If this is something that is in your budget, then I recommend looking into it. Man vacuum cleaners are an upwards of $200 at this point anyway, so this makes for a worthy alternative! Before I go to bed, I tidy up. I fluf the pillows on the couch, fold the blankets, make sure that there's no trash or dishes or things that don't belong laying around, I stack the shoes on the shoe rack by the door, and make sure that all of the dishes are washed and/or put in the dishwasher. Waking up to a tidy and clean home is rewarding and helps keep the momentum going day after day. When I was in high school, I had a teacher who told us that if you do something for 28 days in a row, it will become a habit. Try this tdy up tip for 28 days and see if it becomes a habit! Tip #5: Get your Kids in on the Action! If your kids ar anything like mine, they will trash their bedrooms and then live amongst the ruins as if it were no big deal. I found myself frustrated quite often, sorting through their rooms and cleaning up the mess, only for them to make the exact same mess again within 24 hours. I used to have a "laundry day" where I would wash all of the laundry. I figured that it was better than doing laundry all of the time. What ended up happening was that I was doing 6 or 7 loads of laundry all in one day! This resulted in piles of laundry to fold and put away, and inevitably, it would end up sittin in baskets or in folded piles for days because I got busy doing other things. It was a disaster. To alleviate this problem, I started doing smaller and more frequent loads. When one of the kids fills their basket, they take it to the laundry room and I wash it immediately. This makes the laundry more manageable and I no longer have piles of laundry to fold and put away on laundry day. Also I save time by using Tide Pods! I was so reluctant to use the pods because the whole concept seemed super odd to me, but once I started using them I was hooked. They are so convenient, and my laundry is just as clean. So if I leave my bedroom, and my basket is full, I take it with me, dump it in the washer, throw in a Tide Pod, hit "start," and I'm back to Netflix in just a few minutes. Amazon has a Dash Button for these, too! Tip #7: Make your Bed Every Morning! One way to give yourself a satisfying feeling in the morning is to make your bed. If your bed is made, your bedroom will automatically look more tidy and you will be encouraged to keep your room tidy. Making the bed only takes a few quick minutes and has big payoff. I am absolutely not a morning person, but I still manage to get the bed made every morning - trust me, if I can do it, you can do it! Did you know that you can use Downy Unstoppables as a home fragrance? I absolutely love the way those things smell when I put them in my washing machine, so using them to scent my whole house was a no-brainer. You can use a wax warmer pour some of the Unstoppables into the warmer, and waa-laa! Your whole house smells fantastic. Another fragrance hack is Fabulous! This purple cleaning product is inexpensive and smells so clean. It is a great all-purpose cleaning product, but you can use it as a fragrance for your home by pouring a cup of the solution into a small pot and heating it on low on the stove. It will make your home smell fresh and clean. Tip #9: Make a Schedule for Deep Cleaning... and Stick to It! Deep Cleaning can be time consuming, but if you break the tasks up and schedule them, it won't take as long. I don't set a specific time for deep cleaning the whole house, instead I schedule each task at different times. For example, during Spring Break and Winter Break, I pull all of the curtains down and wash them because after a few months they have colleted dust. During Summer Break, I do the bigger ticket items like organizing closets and purging clothing, and cleaning out the garage. Once a month I clean out the fridge and organize the pantry. Once a week, I deep clean the bathrooms. Breaking the tasks up makes the process less overwhelming, and if my home is relatively clean to begin with, these tasks don't take as long as they would if I didn't carve a few minutes out here and there to do the smaller tasks. Tip #10: Don't be a Hoarder! I tease my husband for being a hoarder because he brings home random bits that he finds and they collect in the garage. Thus the life of being married to an engineer. A big part of having a clean home is having a home that is not full of clutter. Decluttering can be difficult and overwhelming, but it pays off. It's easier to organize when you have fewer things. It's easier to tidy up when there are fewer things laying around. The truth is that a lot of the stuff we keep around our homes we don't really need, so don't be afraid to purge. Have a yard sale! I am big on purging. Have I used this in the last few months? No? It's gone. Do I wear this? No? Gone. I have actually opened the junk drawer before and dumped the entire thing in the trash because obviously we don't need any of it - if we did, it wouldn't be sitting in a drawer full of other junk that never gets used. Right? It made sense to me, and no one missed the stuff. I hope that these tips are helpful and inspiring and help you keep your home in order! If you have any other tips to share, pop them in the comments section.